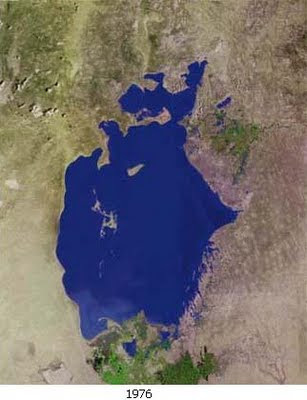 The Aral Sea (actually a lake) was a landlocked body of water in Central Asia. 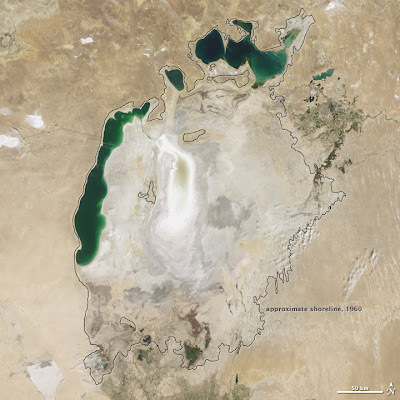 A half century ago, it was the world's fourth largest inland sea. It was fed by two rivers, the Syr Daria and the Amu Daria (the ancient Oxus). Beginning in 1959, the Soviet Union began a series of large irrigation projects aimed at increasing amount the amount of commercial crops, mostly cotton, grown in Kazakhstan, Uzbekistan, and Turkmenistan. As less and less water reached the sea, it began to dry up. As the shoreline receded, fishing villages became landlocked. Soon, that ceased to be a problem as increasing salinity killed most of the fish in the sea. Dust blowing off the lake bed, carrying with it salt and various pollutants, has become a public health hazzard. With the loss of the moderating effect of a large body of water, the summers have been getting hotter and the winters colder in that part of Central Asia. By 2000 the sea had separated into three, barely connected, parts. The larger, southern, part had divided into a shallow eastern lobe and a deeper western lobe. The northern part of the sea, which had always been somewhat seperate from the rest, was an independent lake. 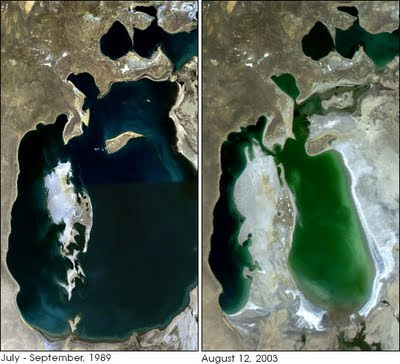 In 2005, Kazakhstan built a dam between the lake’s northern and southern parts to stop the loss of water from the north. While the northern lake has returned to a degree of health, this doomed the south. The eastern lobe completely dried up earlier this year. 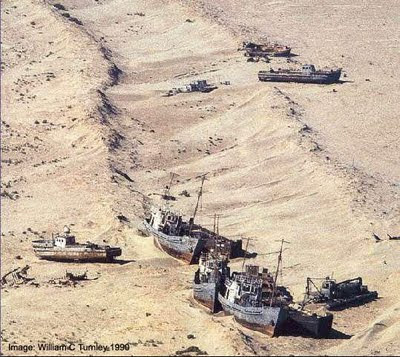 Ironically, the northern lobe, which was once called the Small Aral Sea, may soon be the only Aral Sea.